The inevitable revealed itself Friday as Federal Reserve Chairman Jerome Powell said in a speech at the central bank's annual retreat in Jackson Hole, Wyoming that a gradual rate hike is to be expected--a common notion felt in the U.S. capital markets. In June, the Fed hiked interest rates for a second time, bringing the federal funds rate up 25 basis points to its current level of 2 and now more is expected to come albeit at a snail's pace. "I see the current path of gradually raising interest rates as the (Federal Open Market Committee's) approach to taking seriously both of these risks," said Powell. "As the most recent FOMC statement indicates, if the strong growth in income and jobs continues, further gradual increases in the target range for the federal funds rate will likely be appropriate." 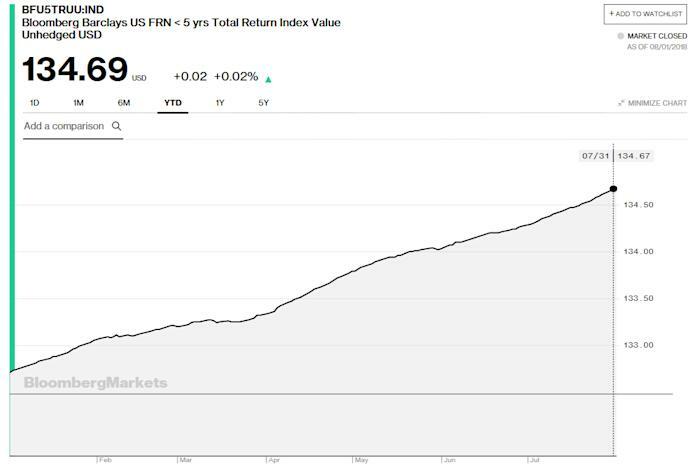 That said, fixed-income investors can take advantage of the slog through the rate hikes to come through the rest of 2018 via fixed-income ETFs like the iShares Floating Rate Bond ETF (FLOT), which tracks the investment results of the Bloomberg Barclays US Floating Rate Note < 5 Years Index. The ETF focuses on investment-grade floating rate notes that track the underlying index, which has been on an upward trajectory looking at its year-to-date chart. The floating rate component will allow investors to capture any gains from short-term rate adjustments that the Fed will most likely make. Based on performance provided by Yahoo! Finance, FLOT has generated trailing returns of 1.18% year-to-date, 1.90% the past year and 1.44% the past three years. Versus similar benchmarks in its category, FLOT is outperforming its peers by 10.28% year-to-date and 68.14% the past year.